Far from the storm centers of the American civil rights movement, off-camera and outside most reporters' beats, countless, nameless individuals reached their own accords with the era's massive changes. Unsure what was expected of them--or even who expected it--blacks and whites taught themselves how to live and work in a new world, often not of their own making. Drawing on the author's long career as a southern journalist, this series of closely related sketches, stories, and essays recounts what James calls the "hidden story of the civil rights movement." Set mainly in Georgia, North Carolina, and Alabama from the late 1950s to the early 1970s, these pieces tell of the individuals and localities whose identities are lost in the widely accepted history of the movement. James also depicts many of the era's well-known figures, revealing private sides known to very few outside political and journalistic circles. In his profiles of famous public figures from Barry Goldwater and Lady Bird Johnson to Jimmy Carter and Jesse Jackson, James offers a challenging mix of comments and criticisms related to ethics, ambition, and public spirit. In these pieces he also imparts the ambience of the hard-drinking, hard-talking relationship between journalists and public figures that has since evaporated into the cynicism of press packets, photo opportunities, and expos s.
From his chronicle of a decade-long battle for the political control of one rural Alabama county to his vignette on a White Mothers of America protest, James provides new perspectives on the people and places, confrontations and compromises that have shaped the New South. In They Didn't Put that On the Huntley-Brinkley! newspaperman Hunter James introduces some of the famous and the unknown figures of the civil rights movement. James employs perception, humor, and experience to look at the South of the sixties and make its tensions and battles understandable. Newspaper people fancy themselves as writing the first drafts of history. James, with the benefit of thirty years of hindsight and reflection, has produced a damn fine second draft. 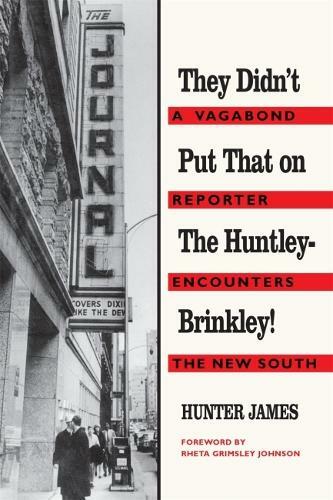 You might as well go out and buy a copy of Hunter James' They Didn't Put That on the Huntley-Brinkley! because it is destined for classic status. James himself is central to the book, though he doesn't dominate it. That, taken with everything else, represents a solid accomplishment, one which, hopefully, will attract a generation of readers too young to remember the history subtly portrayed here.